Try Ebay for NOS, aftermarket and used. Best place really unless anyone on here has some which is quite likely. 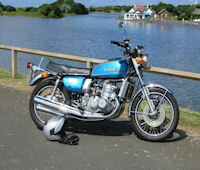 I bought a set of NOS for a 76 GT550A for about £60.00 with rings last year and used them so they do come up. Baz has just put Cruzin Image pistons in my chrome bores. Only done 30 miles so far, but they seem fine. Baz ordered them as part of a full rebuild. Make sure your bores are ok for standard pistons first as pistons should be matched to bores. If you buy new pistons and need the bores reboring, you've wasted a lot of dosh. Just noticed CI has a silly postage price at the moment for pistons (£500!!!) probably means he hasn't got any in stock. They also do .50 and 1.00 oversizes. If you ask him about the postage, tread very carefully he can be very sensitive and has a tendency to block people he decides he doesn't like.